Generic superhero doesn’t begin to cover it. 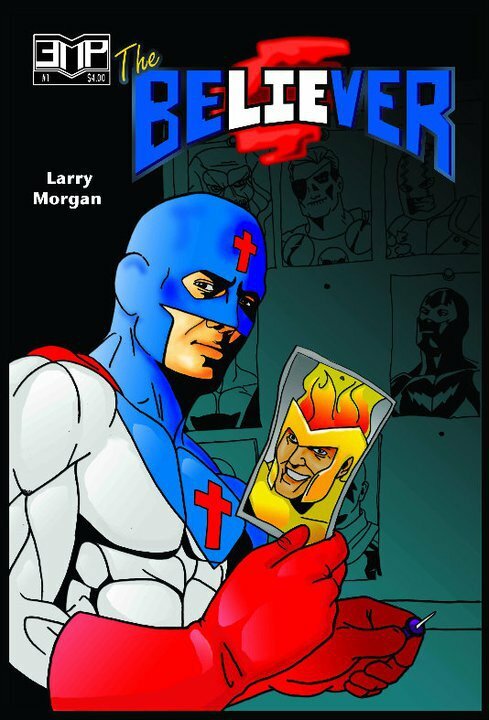 So today I am reading The Believer by Larry Morgan for Electro-Magnetic Press. I actually got a physical copy sent to me for this one so I’m a little out of my element (I normally do PDF based reviews here) but that doesn’t mean much. I see a few crosses and some superhero goodness so lets jump in! 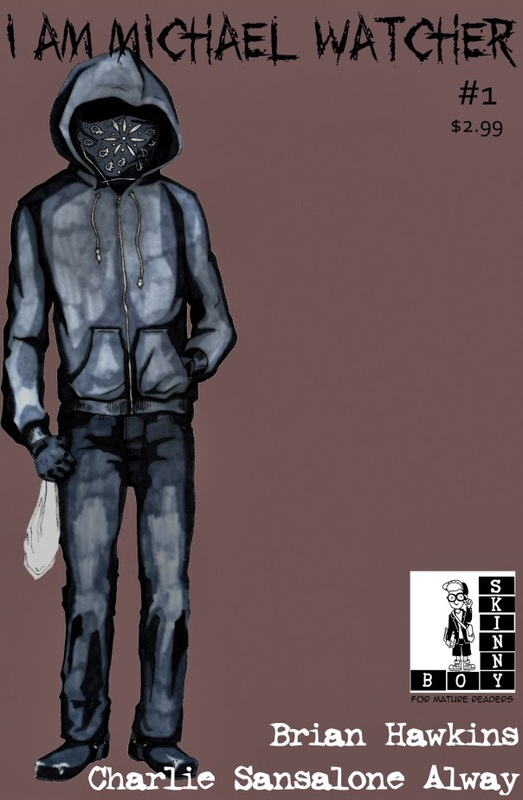 The first thing about this comic is the character design and to be honest, it is not very inspired. He looks like someone was made on HeroMachine.com and doesn’t have anything super defining about his appearance other than the cross over his head and heart (oh yeah and on the bottom of his boots too). It gives me the “BibleMan” vibe and in the worst possible way. The cover has him with a variety of colors and an asymmetrical “v” shaped neckline that extends over his heart and down his arm in blue. This might translate well in a color comic, but we have a black and white comic and this is just left white (like the rest of his suit) and kind of comes off as an odd out of place line at times. He also has this magically disappearing cape that is sometimes replaced with a shield and sometimes just not there (it varies from panel to panel). The art in this comic is decent at times but at other times it is downright terrible (see Midnight Man’s hand on page 7). It’s obviously drawn by something with talent as the perspective and profiles are spot on. Part of me things it is partially traced or drawn by multiple artists because some parts are excellent and others are unforgivably bad. The jarring differences are blatantly apparent and causes a very weird disconnect. The art also suffers a bit in the details, foremost in musculature and the background. The background of most panels are left white and I lost what was happening because I lacked any sort of visual cues as to what is going on (example: When a character is falling I was not sure if they are just standing funny or falling). And since the story jumps so much it’s nearly impossible to follow what it is going on at time. Images also clip beyond their stroke sometimes (example top right panel on page 5) which makes me wonder how these were drawn (like like vector artwork?). The story reads as generically as possible. I really hate to use the word, “generic” because generic superhero stories are a pet peeve of mine. They feel like cheap knock offs and try to use the same tropes used by writers of established heroes and it always falls flat unless it is in parody. The story here is that there is a generic hero, with generic powers, who fights genetic villains, in a generic universe that wouldn’t be out of place in a major publisher (except without as much history, depth, background, continuity, etc). I kept waiting for this to turn out to be a joke or a parody but it wasn’t. It just kind of read like a recap of a generic superhero universe that I wasn’t invested in. I’ve seen that song and dance a thousand times before. There is so much exposition crammed into the front had of the book that only a miracle could save it and the second half of the book is basically a fight scene between two characters. It doesn’t advance the plot much, it doesn’t tell us who these guys are, the set up is weak, and honestly- it is just really stale. One thing I did like about it was the ending. It gave me a glimmer of hope for this character. It was a single pearl in a pile of mud though. However, even then the execution was flawed. A good twist, like they pulled at the end, needs build up and context. We are never given a hint or reference that this is something that could happen or how out of place this would be in the world (despite all the exposition in the front half of the book). If you pull a twist with no investment or build up, it doesn’t work. It’s just random. The dialogue is dry and comes off like a parody of human speech. Most of it is exposition or explanation of things. People hardly talk- they make declarations or attempt one-liners. It feels like the characters are giving us the cliffsnotes version of the story. If the staff slowed down and gave their characters time to develop and impress upon us who they are it might not have been as bad but they rush it. We basically get what could have been two or three stories in one comic and only a few pages per story. Each of them could have been pushed into a full issue to give us time to really get into the nitty gritty of this big universe. All and all I am really disappointed in this comic. 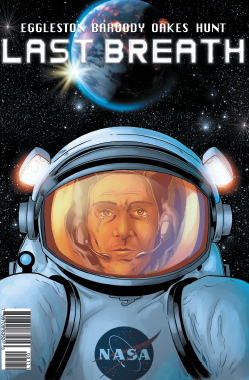 There is obvious passion, forethought, and a bigger story trying to be told in this comic that the skill of the writer can’t execute properly. In the hands of a more veteran writer this might have been a great plot with an amazing twist but instead it’s a forgettable comic with a slight shrug on the last page before you close the book.